My sister just got an iPhone and called me from Best Buy asking me about an iPhone speaker dock to plug it into… working with a budget of about $200 I told her to skip the model she was looking at, and save some money by going for the same Altec Lansing T612 set that I have. This recommendation comes directly from personal experience, there may be better ipod speakers out there, especially at a higher price point, but out of the three brands and various models I have direct experience with, the Altec Lansing T612 blew the others away, and its $160 on Amazon. * Airplane mode is not required with the iPhone, meaning keep your phone on, get calls, and have no cellular interference! * Remote control is fully compatible with speakers, power, volume levels, and iTunes. * It’s small and lightweight so you can carry it around your house/apartment, into the yard, anywhere there’s a power outlet, plug it in! I can’t recommend this model enough for iPhone users. The problem with many iPod docks when you plug an iPhone into them (assuming the iPhone will even fit) is that they will get massive interference from the cellular network! You’ll get an often constant buzzing sound as the cellular waves interfere with the speakers, this does not happen on the Altec T612 because it is shielded. There is no need to put the iPhone into airplane mode like so many other iPhone Speaker docks require, you can still receive and make phone calls with your phone while it’s plugged in and charging. Of course since it’s a speaker system, what you want to know is how good it sounds, right? The sound quality on this thing is pretty amazing, it produces rich bass and a crisp sound even though the entire device is relatively small, and it can easily be cranked up very loud to entertain a social gathering or party. In warmer weather I frequently bring the Dock out back and play it into the yard for BBQ’s, it’s plenty loud and sounds great. Although I use it with my iPhone, it’s actually compatible with far more than just the iPhone and iPod Touch, including all of the following iPod’s: iPod mini; iPod nano 1G, 2G, 3G, 4G; iPod classic 4G, 5G, 5.5G, 6G; iPod touch 1G, 2G; iPhone 1G, 3G. This compatibility makes it easy for other people to come over and plug in their iPod to share their music and charge their own devices up. So that’s my personal recommendation for the best iPhone speakers, and I don’t think there is any real competition anywhere near the price range. 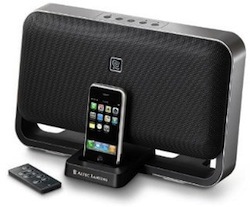 You can get the Altec Lansing T612 Digital Speaker for iPod and iPhone on Amazon for around $160 with free shipping. I think a more appropriate title would be ‘the best and most affordable’ dock, because there are options that are close to $1000 which no doubt sound way better than this set. I went middle of the road and have a Bose dock that I spent around $450 on and it sounds great, I haven’t heard the Altec but for a fraction of the price you have to wonder how it would compare, or is that Apples to Oranges? I don’t doubt it’s a good set of speakers but the best is a bold claim unless you specify a price range. I agree with your assertion that the Altec T612 is amazing. In fact, I think Altec’s products deliver fantastic sound across the board. They have great depth of sound and are not tinny. I’ve spent hours in stores sound testing ipod/iphone speaker docks and, to my ear, Altec comes out way on top in its price range, and often sounds better than systems that are more expensive. The iM600 is a great player too, and the rechargeable battery makes it super portable for taking out to the patio or on a picnic, etc. I am not officially involved in Altec L. in any way, btw, I just really love their stuff!